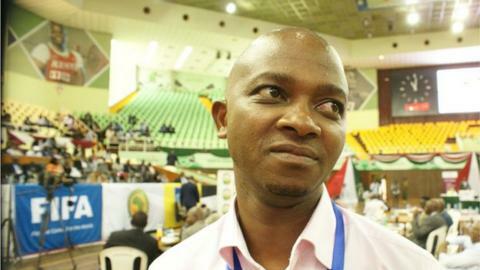 Nick Mwendwa has been voted in as the new president of the Football Kenya Federation. He won 50 of the 77 votes cast, to beat out his only rival Ambrose Rachier, the chairman of top Kenyan side Gor Mahia. Mwendwa is the chairman at a a lower league side, Kariobangi Sharks. Incumbent Sam Nyamweya withdrew from the elections just before the voting began, three other candidates withdrew in the days before the polls. "I've made this decision [to withdraw from the elections] out of love for the game, passion and appreciation and that no good leader should be pushed to give up power," Nyamweya explained. Investigations are still being made into allegations of corruption against Nyamweya, charges he has denied. He and two other officials are being investigated for "conspiracy to defraud". Kenya's Office of the Director of Public Prosecutions began looking into the case in December following a recommendation from the Directorate of Criminal Investigations. The case centres on how almost US$170,000, set aside for Kenya's trip to Cape Verde for a 2018 World Cup qualifier in November, was actually used.